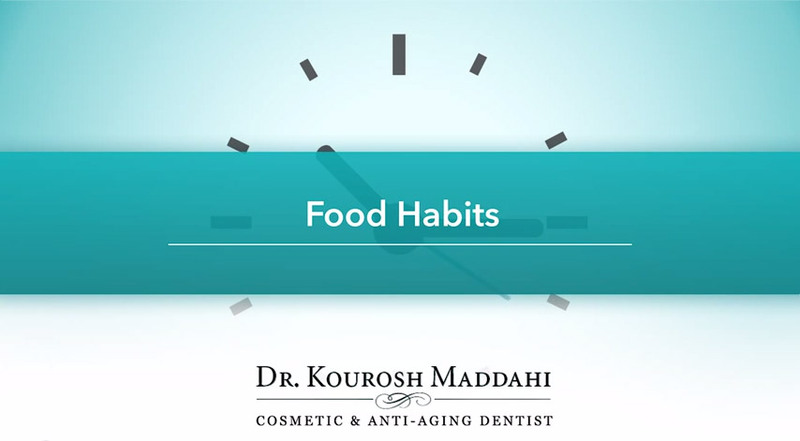 One of the most frequently asked questions of Anti-Aging Treatment is, “What can I do in my daily routine?” So, we have gathered up the best tips and tricks from Beverly Hills Cosmetic Dentist, Dr. Kourosh Maddahi himself here for you! Tip: Grey is a very aging color, not least of all when in the mouth. Deep reds like wine, blues like in blueberries, or greens like in green juices or tea tend to stain teeth grey. Trick: Don’t avoid these highly beneficial foods! Avoid the stains. Wherever possible drink them with a thick straw or vented lid like you’d find at Starbucks. In the case of wine, where you might not want to drink through a straw, try brushing your teeth immediately after consumption to reduce absorption. Tip: Cracked teeth can be uncomfortable and unsightly. Trick: Over the last decade the number of cracked or broken teeth went up dramatically due to a health movement that made whole almonds or other nuts a go-to snack. These highly nutritious sources of protein however are very hard on teeth and can cause fractures very easily. The good news is almonds are just as beneficial when sliced or in spread form. So go for sliced nuts or butters to avoid an unnecessary trip to the dentist. Tip: There are natural anti-aging treatment options to keep your teeth whiter and brighter! Trick: Fruits that are high in fiber like apples can actually have a whitening affect. The fiber in the fruit acts like a sort of scrub for your teeth, reducing the stains that may be on the surface of them. Tip: Healthy pink gums can make your smile appear much more pleasant. Trick: Along with a flossing daily, rinsing with Dr Maddahi’s revolutionary mouthwash Oral Essentials that has a key ingredient to maintaining healthy oral tissues, Sea Salt! This rinse contains Dead Sea salt, the most potent salt in the world, along with a number of other highly beneficial ingredients like Aloe Vera and various essential oils. This refreshing mouthwash will help promote a more harmonious grin.